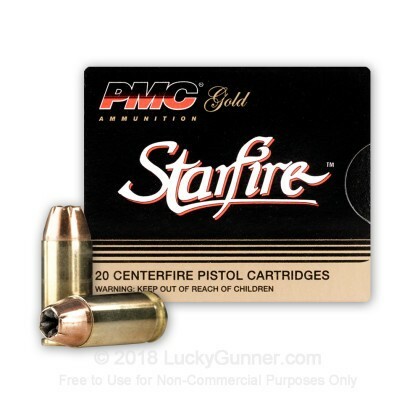 PMC's Starfire ammunition represents PMC's premium line of personal-defense ammunition. The Starfire line features their patented rib-and-flute design which is made to have expansion in soft tissue that results in threat stopping power. 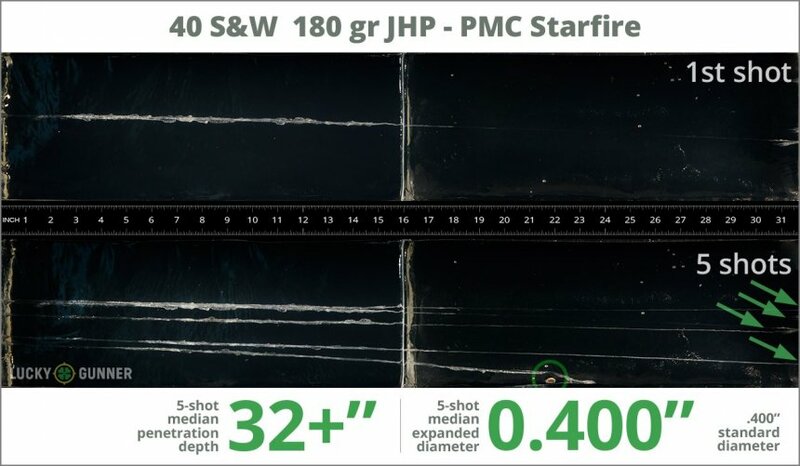 We wanted to know exactly what happens to a self-defense handgun bullet on impact, so following FBI protocols, we fired five rounds of PMC 180 gr Starfire from 10 feet, through four layers of cloth (to simulate clothing), into synthetic ballistic gelatin. The photos below show the bullets recovered from the gelatin after being fired from a Glock 27 pistol. There’s also a high speed video that shows the bullet impacting the gelatin block. 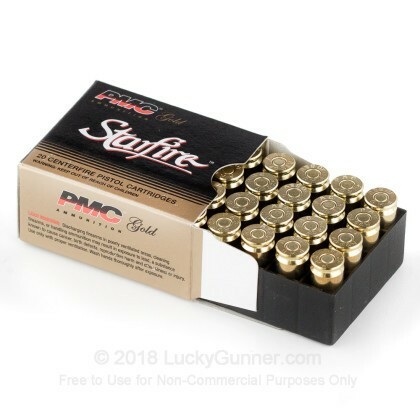 In addition to the .40 S&W (Smith & Wesson) PMC 180 gr Starfire, we tested over 100 other self-defense loads, so check out Lucky Gunner Labs for the full story. 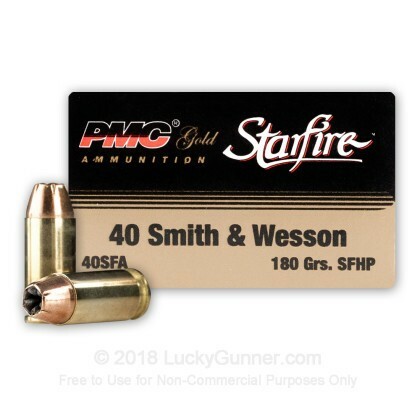 How do the results for this PMC .40 S&W (Smith & Wesson) compare to other 40 S&W Ammo? 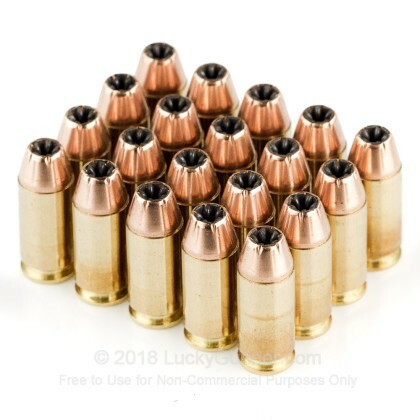 32" 0" 9.8" 16.5" 32" This ammo: 32" Min: 9.8" Median: 16.5" Max: 32"
Might as well be carrying FMJ - consistent failure to expand and consistent over penetration. 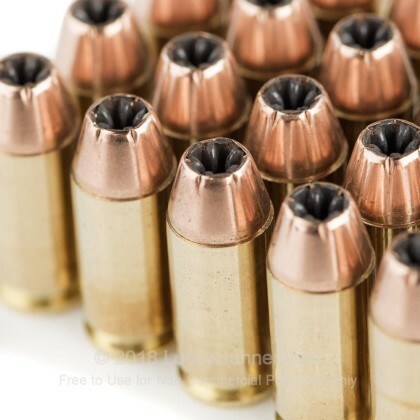 This ammo is reliable, but what you can rely on is that it performs exactly like FMJ. Good value. Quick shipping. Excellent product. Good ammo however it did not expand as anticipated! Service was very quick. Faster than I expected. Ammo seems to fire very well and quite accurate. We will be ordering more very soon. Look forward to the same quick service and dealing with a well knowledgeable staff. It is nice to deal with friendly and professional people that know what they are doing. Great Product!!!!! Would buy again!!!! I bought several boxes of this stuff back when the big ammo crisis was in full swing. It was expensive then just as it is now, but it was available, so I caved in and bought some. I suppose it was okay at the time for target practice, and I'm sure it probably does a great job covering its intended purpose as SD ammo. I did notice a lot of smoke in the air after firing them. And maybe it was just me, but I also noticed an obvious jump after firing each round - more so than any other ammo I'd fired before. 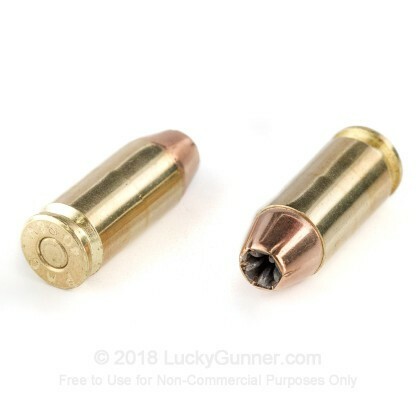 I'm thinking I'll stick with the USA companies from now on - for both practice and SD ammo. And as always, LuckyGunner shipped my product pronto as promised. LG is BY FAR the best web retailer of ammo that I've ever dealt with.